The HP Laserjet Pro 400 M401D is a monochrome laser printer with efficient printing, designed for personal use. This robust device comes with impressive productivity by handling 50,000 pages per month. It produces professional quality output for a great value. HP Laserjet Pro 400 M401D toner cartridges is easy to install and comes with high capacity, increasing the overall efficiency of the printer. The printer weighs approx. 10.7 kg and measures 364.6 x 368 x 267.5 mm respectively. The printer has a small control panel with 3.5-inch LCD display screen. The device runs on 800 MHz processor with 128 MB of RAM. It supports USB port and also offers automatic two-sided printing to reduce paper wastage. The printer supports 50-sheet multipurpose tray and a 250 sheet input tray. It supports a wide range of print media which includes recycled and rough paper, labels, cardstock, transparencies, and envelopes. The printing resolution of this device is up to 1,200 x 1,200 dpi with print speeds up to 33 ppm. It delivers prints with bold, crisp text and sharp images. It also offers HP Auto On/Off technology to reduce the energy consumption. The HP Laserjet Pro 400 M401D printer comes with efficient printing and fast print speed. The printer is easy to install and supports USB port, automatic double-sided printing and also offers HP Auto On/Off technology, thereby reducing the environmental impact. However, the printer lacks many advanced features such as ethernet and wireless connectivity, mobile printing capability and ADF support which might be the major features many consumers may look for. The printer has high capacity HP Laserjet Pro 400 M401D toner cartridges which result in low running cost of the printer. How to correct fuser to fix printing defects? The HP Laserjet Pro 400 M401D is a mono laser printer. The printer works well for home and offices. It is known for its high quality printouts. The printer is shipped with HP Laserjet Pro 400 M401D toner cartridges. This problem is often caused due to the type of paper being used for the prints. At other times, the paper might not match the settings in the printer software. See which paper is present in the paper tray and accordingly change the settings in the printer control panel. If required then choose a lighter paper type. Print the document once more. The paper type might not match the settings in the printer software in your system, please do the needful. If the problem persists, then go on to the Edge-to-Edge menu in the printer software and choose Normal. Take another printout. In the printer control panel, select the Auto Include Margins option and print the document again. Always make the use of HP Laserjet Pro 400 M401D toner cartridges for a good quality printout. You can easily purchase the new toner cartridges online. Q. What type of media can HP Laserjet Pro 400 M401D print on? A. HP Laserjet Pro 400 M401D can print on Bond paper, Card stock, Envelopes, Heavyweight paper, Labels, Lightweight paper, Plain paper, Recycled paper and transparencies. Q. Can HP Laserjet Pro 400 M401D be used for colour printing? A. This printer cannot be used for colour printing as it is a monochrome printer. It only supports black and white printing. Q. What are the advantages for ordering compatible HP Laserjet Pro 400 M401D toner cartridges over the original ones? A. Our compatible HP Laserjet Pro 400 M401D toner cartridges are much cheaper to purchase compared to the original cartridges. We assure that you will not be making any compromise on quality as these cartridges are rigorously factory tested to the same ISO standard as the original brand ink. There are also environmental benefits of purchasing compatible cartridges as they are made from recycled cartridges that were used previously resulting in very little usage of new materials or components. Q. What is the maximum monthly duty cycle of HP Laserjet Pro 400 M401D? A. HP Laserjet Pro 400 M401D has a maximum monthly duty cycle of 50000 pages. Q. How much time will it take to deliver HP Laserjet Pro 400 M401D toner cartridges if I order from Dublin? A. All our orders are delivered by Fastway Couriers. Approximately 90% of our orders received before 12 noon daily are despatched same day and delivered on a 1 - 2 delivery day basis. Fastway couriers will deliver between the hours of 9am - 5pm (Monday - Friday) However, if your need is urgent, you can call us on 048 30833221. There are times when we are unable to keep our promise of 1-2 delivery due to a rural location or Fastway couriers’ network distribution. Q. Does HP Laserjet Pro 400 M401D support borderless printing? A. HP Laserjet Pro 400 M401D does not support borderless printing. Q. Are your HP Laserjet printers compatible with google cloud print? A. Yes, the series of HP LaserJet Pro 400 Printer M401 is compatible with google cloud print. It provides free service that allow you to print documents and photos securely from any mobile or network-connected devices like computer, phone, tablet, or other mobile device to the printer. To register and set up your printer to use the google cloud, opt for connecting and using the Google Cloud Print. Q. What would be the factors that can affect the printer speed? A. If the product prints, but it seems slow, the problem could be with the HP Laserjet Pro 400 M401D toner cartridges that dried up and need replacement. Also the quality of the paper used for printing could affect this. Try out a few solutions. When you configure the product to print on some paper types, such as heavy paper, the product prints more slowly so it can correctly fuse the toner to the paper. If the paper type setting is not correct for the type of paper you are using, change the setting to the correct paper type. If your computer or the product is connected to a wireless network, low signal quality or interference might be delaying the print jobs. Q. How can i Inspect the HP Laserjet Pro 400 M401D toner cartridges for damage? Remove the toner cartridge from the product, and verify that the sealing tape has been removed from them. Check if the memory chip got damage. Examine the surface of the imaging drum on the bottom of the toner cartridge. If you see scratches, fingerprints, or other damage on the imaging drum, replace the HP Laserjet Pro 400 M401D toner cartridges. If the imaging drum does not appear to be damaged, rock the toner cartridge gently several times and reinstall it. Print a few pages to check if the problem resolved. Q. 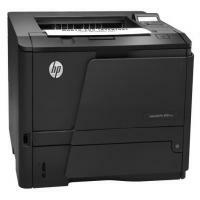 Why should I choose the HP Laserjet Pro 400 M401D over the other printer options available in the market? A. This monochrome printer satisfies the need of bulk printing as it surpasses all others in terms of quality and speed. The toner yield is massive at 2500 to 3000 and can be easily refilled too. The auto-duplex printing option cuts down the paper cost thereby helping the environment. For those having a monthly print volume of 20,000 papers should undoubtedly purchase this high-yield printer. Q. Is colour printing possible with the HP Laserjet Pro 400 M401D printer? A. The HP Laserjet Pro 400 M401D is a monochrome (black and white) printer and does not support colour printing. Q. Can I set this printer on my own? A. The HP Laserjet Pro 400 M401D is easy to setup and install unlike the other complicated printers available these days in the market. One can easily follow the instructions in the manual and install the printer on your own. Q. What are the other benefits of this printer? Q. How long would the HP Laserjet Pro 400 M401D toner cartridges last? A. The HP Laserjet Pro 400 M401D toner cartridges last quite long and have a massive printing capacity. The replacement of the toner cartridges can be done by the HP CF280X (Black) and HP CF280A (Black). The HP CF280X (Black) can print up to 6900 pages and the HP CF280A (Black) can print up to 2700 pages. The toner cartridges reduce the cost of printing tremendously owing to their high printing capacity. Q. What other cartridges can be purchased other than the original HP Laserjet Pro 400 M401D toner cartridges? A. The HP CF280X (Black) and HP CF280A (Black) are compatible with the HP Laserjet Pro 400 M401D printer and both can be purchased online at a low price. Q. Can I refill the original or the compatible cartridges? A. The original or the compatible cartridges can be refilled easily with the toner refill kits available online at low cost. It is advisable to follow all the instructions carefully while doing the refill to avoid leakage or over filling. Q. My printer has been showing some issues lately and the technician advised me to change the imaging drum, should I change it? A. As every machine has a life, so is the case with this printer too. The imaging drum can be easily replaced by purchasing it online at a minimum price. Q. Do I get my money back in case I am not satisfied with the HP Laserjet Pro 400 M401D toner cartridges? A. The company gives a full money back guarantee with the toner cartridges in case one is unsatisfied with the product. Q. Can I go in for bulk buying of the HP Laserjet Pro 400 M401D toner cartridges without drying them up? A. The company recommends bulk buying of the cartridges as it not only reduces your cost but also helps you maintain stock in case you are depleted of your existing stock. One can go for up to 6 months of storing these cartridges if the seal remains unopened. Q. How much ink volume can I expect in the HP CF280X? A. The HP CF280X laser toner can print up to 6900 pages with high print quality.